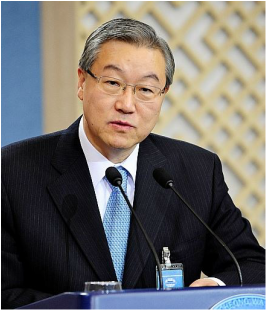 Sung- Hwan Kim was a career diplomat and served as the Minister of Foreign Affairs and Trade of the Republic of Korea from October 2010 to March 2013. He was appointed as a Member of the UN Secretary-General’s High-Level Panel of Eminent Persons on the Post-2015 Development Agenda in July, 2010. After retiring from the Foreign Service, he served as the Chair of Institute for Global Social Responsibility and Distinguished Visiting Professor at the Seoul National University until March 2015. Now he is working as the Head of Volunteers Corps and Distinguished Professor at the Hanyang University. He graduated from Seoul National University, Economics Department in 1976 and studied at University of London, UK, from 1985-87. He received Honorary Doctorate in politics from Samarkand Foreign Language Institute, Uzbekistan in 2003. 김성환 전장관은 직업 외교관 출신으로 2010년 10월부터 2013년 3월까지 대한민국 외교통상부장관을 역임하였다. 김 전장관은 2012년7월에는 반기문 UN사무총장이 구성한 ‘Post-2015 개발의제를 위한 UN 고위급패널’의 일원으로 임명되어 2015년 이후의 SDGs(지속가능발전목표)를 작성하기 위한 논의에 참여하였다. 김 전장관은 외교부에서 퇴임한 후 2015년 3월까지 서울대 글로벌사회공헌단장과 국제대학원 초빙석좌교수로 활동하였으며 현재는 한양대 사회봉사단장 겸 국제학부 특훈교수 로 재임 중 이다. 김 전장관은 서울대 경제학과를 졸업하였으며 1985-87간 영국 런던대에서 연수하였다. 또한 2003년 우즈베키스탄 사마르칸드 외국어대학에서 명예 정치학 박사 학위를 수여하였다.